Named “The Creativity Shaman” by her artist-to-CEO clients, Rebecca Folsom inspires whole system transformation. If you are motivated to thrive, ready to lose your fascination with old stories of limitation, and to live into the reality of new possibilities through essential action, Rebecca is the coach for you. She helps you dissolve old barriers, transmute fear into flow, and take action to live in the marrow of your creative goals. Rebecca invites you into expanded territories so simple people often shake their heads with a “Why didn’t I think of that?” response. You embody openness and flow. You release life-inhibiting static and resonate with the genius that is your birthright. This is where you shine brightest and have creative impact in the world. Rebecca’s approach is direct, kind, and fun loving with the measured precision and care of one who has navigated these streams for a lifetime. Rebecca has refined her coaching methods through more than 24 years of performing, coaching individuals, and leading workshops. Her one-on-one sessions offer supportive, personal depth exploration with practical life changing results. 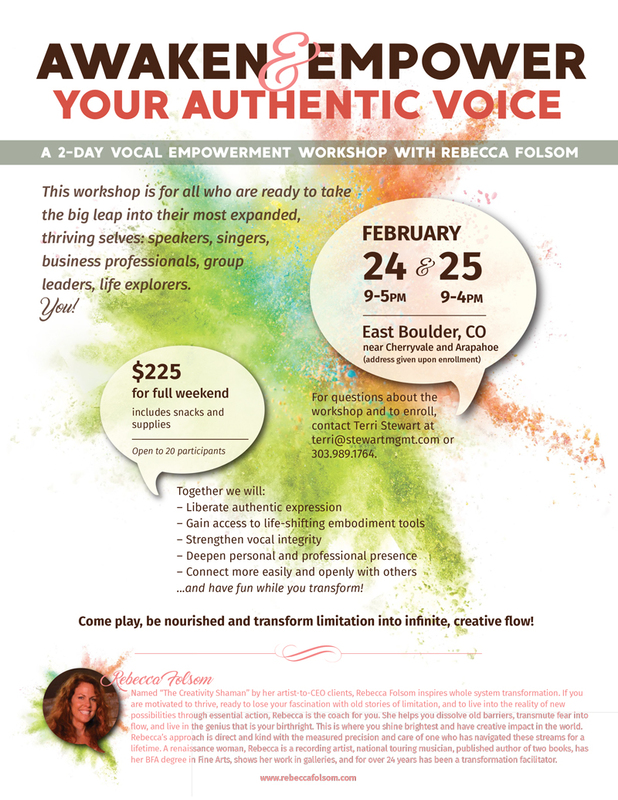 Her workshops offer fertile ground to catalyze individual growth, while at the same time empower community and connection. Life-long relationships often emerge from her workshops. She mixes non-traditional shamanic exercises, Taoist, Toltec, Big Leap, Yogic, and Martial Arts with traditional Vocal, Theater, and Public Speaking techniques to offer deep systemic change. By accessing Body Intelligence, she helps you create the “magic” of streamlined change. author of two books, has her BFA degree in Fine Arts, shows her work in galleries, and is a transformation facilitator. Songs from her most recent songs hit #1 on National Folk DJ Chart, #4 on National Americana Country Charts, and #42 for the year 2016 on the National Folk DJ Chart. Radio DJs deemed it “Stunning” and “Spectacular.” Boulder Magazine called it “Achingly Beautiful.” She has played Opryland, The Bluebird, The Bitterend, Falcon Ridge Festival, Rocky Mountain Folks Festival, Kerrville Folks Festival, and BBC Radio and Television. Her songs crack open hearts, awaken longing, and inspire listeners into expanded perspectives.